The Guides planned the party, so we didn't have to do anything! I love these kinds of nights! 6:30-7:00: They arrived and had fun looking at each other's costumes. When they got to rowdy, we corralled them into their patrol tables and told them to go over the activity they were leading that night. 7:00-7:10: We went down to the lobby and paraded around with the Sparks and Brownies units to see everyone costumes. 7:10-7:30: The Red Roses read the ghost story that they wrote the week before and then the Scarlet Tanagers led everyone in some Halloween songs. 7:30-7:50: Let the games begin! The Forget-Me-Nots brought in a drawing of a witch and made paper wands for everyone to play Pin the Wand on the Witch. 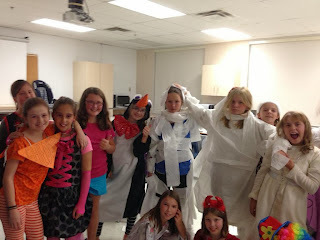 Then they split the unit into two teams and they gave them five minutes to wrap the tallest girl in toilet paper to make a mummy. The girls had a lot of fun with both games. 7:50-8:20: Snacks! They brought in lots of good food and it was all delicious. There were cupcakes, brownies, cookies, fruit, and chips.